Should I buy a home on a steep hillside? Buyer #1: Wow! Look at those expansive, unobstructed ocean views! Buyer #2: Wow! Looks like that thing is ready to slide into the ocean. 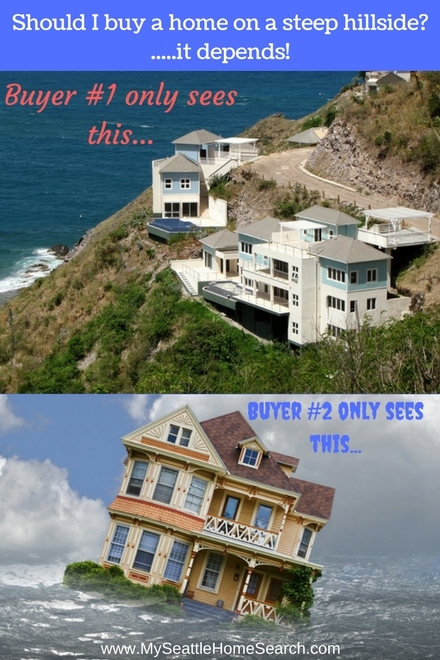 Different buyers will view homes on a steep hill with different perspectives. To some, a home sitting on a steep hillside is a thing of beauty and will love how the land drops below them. To others, it’s a disaster waiting to happen although the home might have been sitting there for the past 100 years and survived the occasional earthquake. Homes on steep slopes comes in all shapes, sizes and locations. From packed-in tight San Francisco condo buildings, to new houses on man made terraces bulldozed into steep terrain to million dollar Seattle homes overlooking the Puget Sound clinging to a forested hill trying to eke out every last inch of that spectacular view. As with all styles of homes and the types of land they are located on, there are both pros and cons. But when it comes to homes on steep hillsides, a buyer has to take into consideration some additional elements when weighing up if a particular home is right for them or whether they should keep looking. So, is buying a home on a steep slope a good idea or should you buy a home on something a bit more terra firma-ish? Note: If you live in Florida, this article will be of no use to you whatsoever unless you are relocating soon.